French clay (aka Sea clay) is the most used and well known of the facial clays. I know for a fact that the vast majority of us have used the Mint Julep face mask. Why? Because we know it works, we know it’s good for healing acne, and we know it’s a comfortable “not as stripping as bentonite clay” but “has more oomf than kaolin clay” type of mask. I reach for french green clay the most for an effective all over face mask. French clay is the best facial clay to use if you have normal to oily skin that can tolerate a bit more purification action . It’s not going to be as powerful as bentonite clay (I don’t think anything is), but it still packs a proverbial punch on blemishes and blackheads! Skin type – Normal to Oily acne prone skin. It’s also rejuvenating, healing, and pore tightening in action – great for shrinking large pores and removing impurities. French green clay contains many valuable elements, two of which make it stand out: its iron oxide content and centuries old plant matter. Yup, ever wonder why French clay is green? That’s because of the high amounts of decomposed plant matter that has gone through the cycles of nature to become this luxuriant clay. It is suuuuper important NOT to purchase french clay that isn’t a truly green or off green color. The lack of pigment will indicate a poor quality product that is probably full of artificial fillers which you don’t want on your skin! Of course, some companies may add colorants to make their product look a nice shade of green. Just try to be mindful of the source! What are the benefits of French Clay? I like using french green clay all over my face to pull blackheads to the surface making them easier to remove with a good homemade sugar or salt scrub. The clay gives my skin a nice fresh glow and I find that my skin is less oily the day I use it as a mask in the morning. I highly recommend you give it a try if oily skin is an issue for you. • Remove with warm water & washcloth the following morning. The blemish will be significantly reduced and less red. • Try keeping any extra mask in a small non-metal container to use during the week. Just remember to use a sanitary scoop so you don’t contaminate the mask with germs. French clay is really good for overall skin revitalization and calming redness and irritation. Its ability to remove dirt, make-up, toxins, bacteria, and other impurities make it the standard choice for all professional spa treatments. I know it’s my favorite! 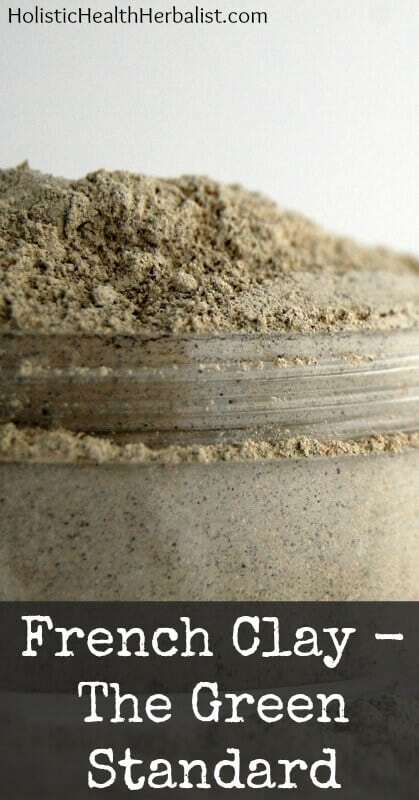 Have you used french clay as a face mask before? What did you think of it? Ciao! I odered a bag of green clay online and was wondering if you had any idea of its credibility. Its called ‘ARGILA NATURAL’ or if you had a recommendation of another brand? maybe one that isnt to steep in price? I’m not sure about its credibilty, but the price isn’t bad considering you get a good 15 masks out of it 🙂 Most other brands sell a lot less for a higher price! I was wondering if you had a moment to answer a little question. I have been washing my face using the Oil Cleansing Method and I have been wondering if somehow my recipe could be turned into a solid bar. to get a “soap bar” like feel. Im afraid I’ll get a brick or mud result, since most clay soap bars have very few oils. Sorry for rambling. Thank you for your time. I see this mask removes make-up toxins. Is there a particular make-up that you recommend that isn’t as harsh on the skin? Mine isn’t too bad but I feel like I get oily quick.. is that just my face or does the make-up have something to do with it? And as for make-up recommendations, I have used Bare Minerals (found at your local mall) with good results, as well as Mineral Fusion which you can find at Whole Foods.